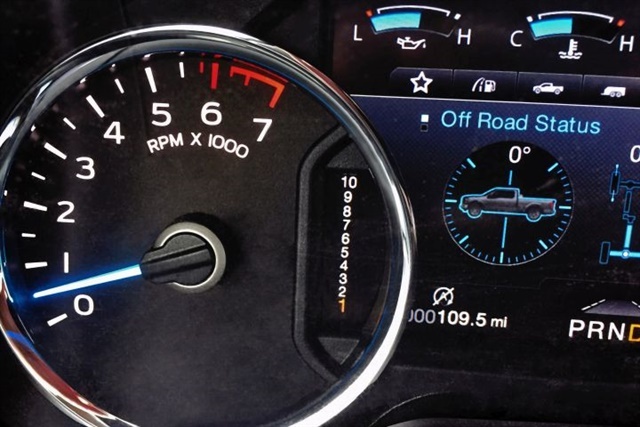 Ford is adding a numbered display for its new 10-speed transmission in the 2017 F-150's instrument cluster for faster gearing recognition. The new 10-speed automatic transmission is replacing the existing 6-speed for the 3.5L V-6 for 2017. Ford is pairing the transmission with its second-generation 3.5L EcoBoost V-6. The new transmission will deliver improved acceleration and performance with optimized wide-span gear spacing coupled with drag-reduction actions. Three overdrive gears and a wider span enable lower-numerical rear-axle ratios to help improve fuel efficiency at highway speeds while still maintaining towing performance, according to Ford. Smarter shift logic improves operation during tow/haul mode. New adaptive shift-scheduling algorithms monitor more than a dozen powertrain and driver control signals to the transmission finds the right gear at the right time, according to Ford. Ford is investing $1.4 billion in its Livonia Transmission Plant to create or retain 500 hourly jobs to build the new 10-speed.